I told you guys I had too many bananas. 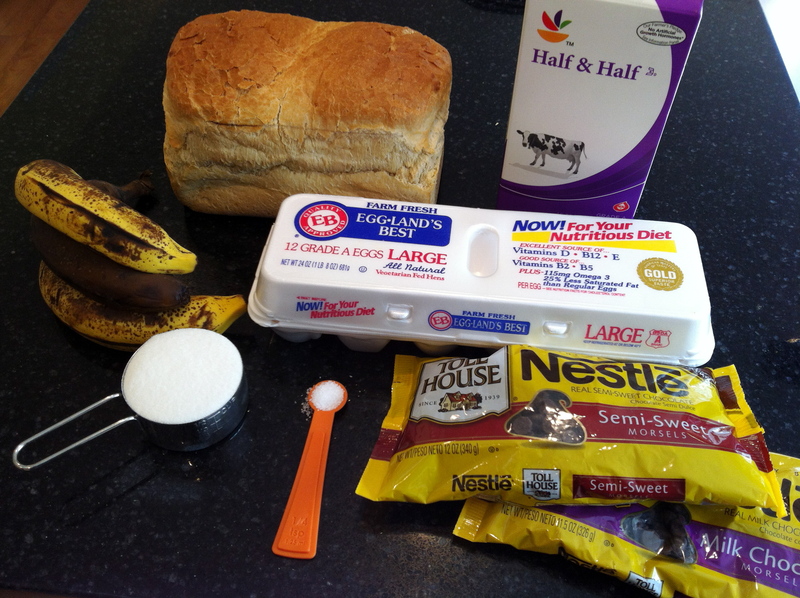 Ok – after this we’ll be banana free for a bit. 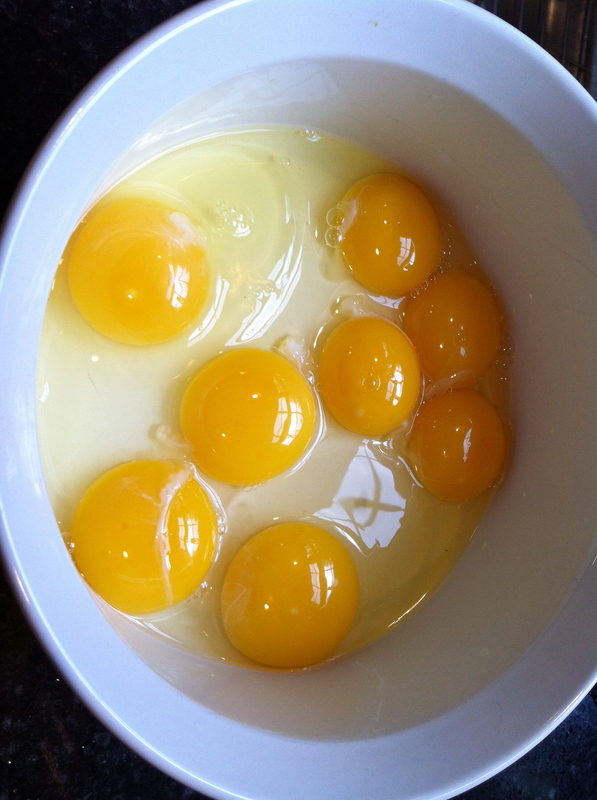 Hope you try this and hope you forgive me for not retyping the ingredients. 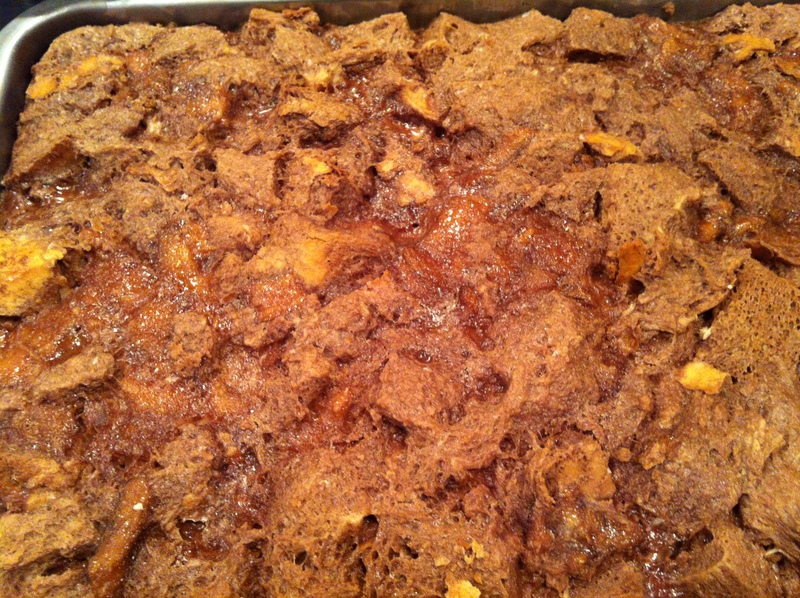 (Recipe can be found in the Flour Bakery Cookbook – again). 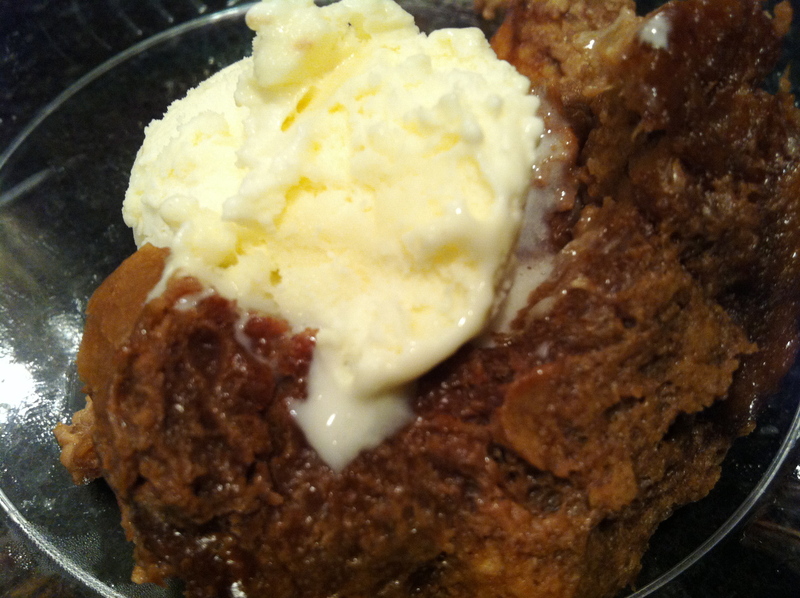 This is the first time I made this recipe but I’m a chocolate pudding risk taker. 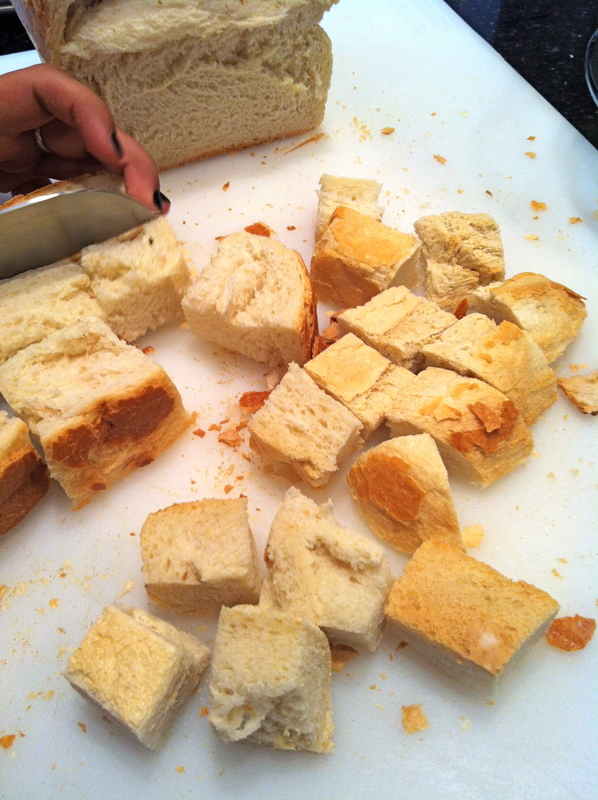 Cube the bread and put in a wide, shallow pan. 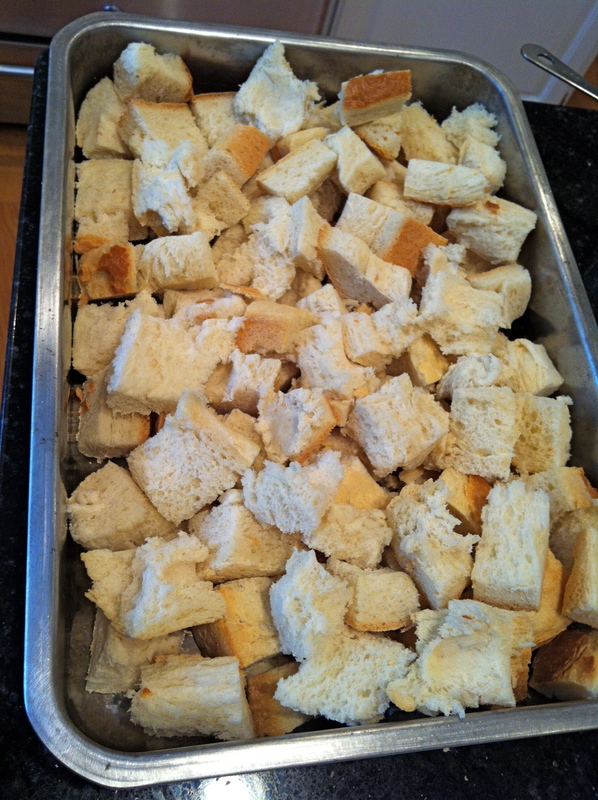 I used a loaf of day old bread from the local bakery but any old bread would do. 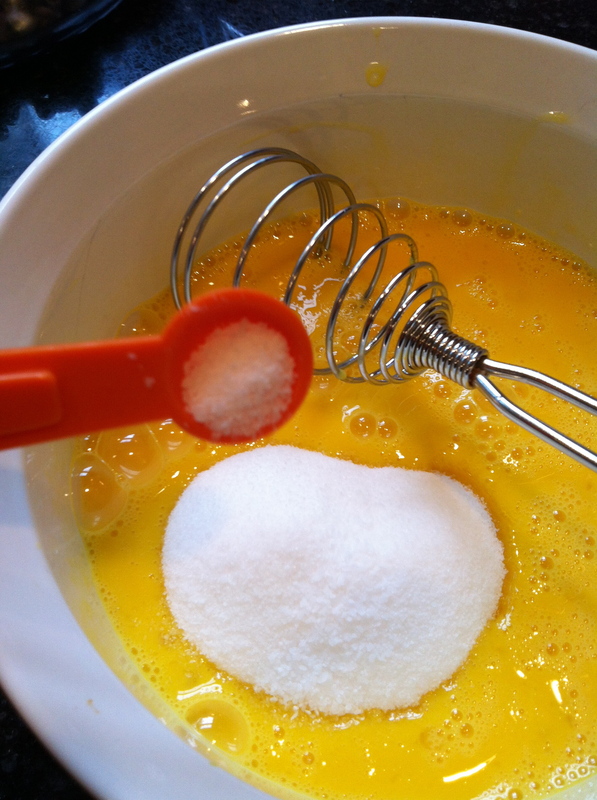 In a separate bowl whisk together the eggs, sugar and baking soda. 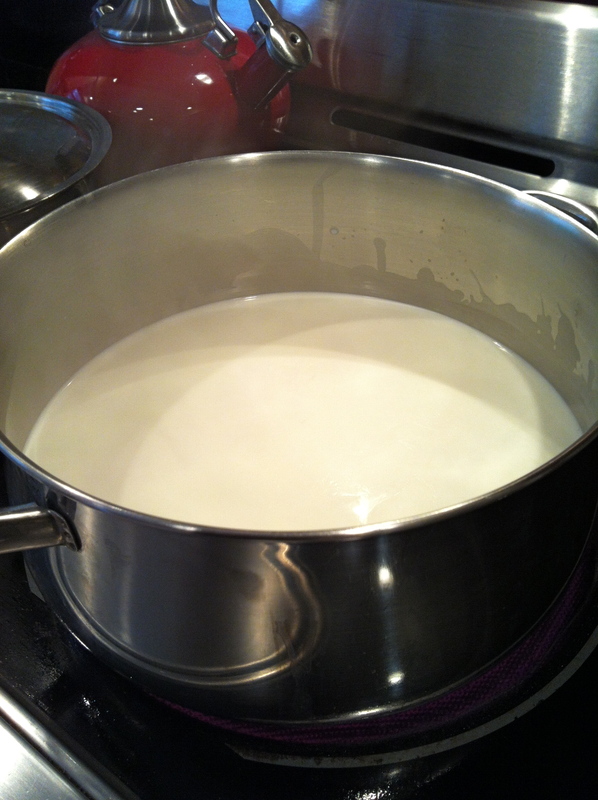 Heat the half&half to scalding but not to a boil. So basically a thin skin will start forming but no bubbles. Although I saw a couple of bubbles but nobody’s perfect. 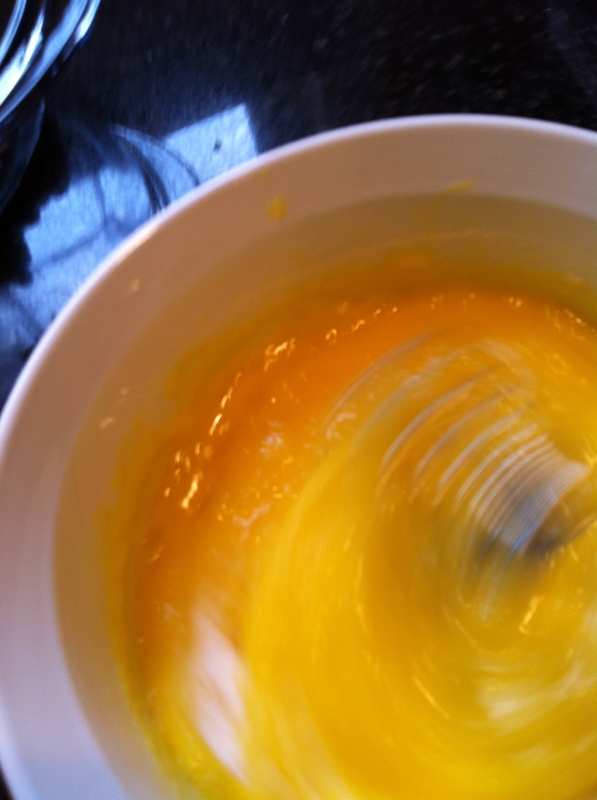 If you are perfect, you’ll start heating the half&half before cubing the bread and whipping the egg mixture, being 100% efficient with your time. Or you can be like me and wait by the stove staring down the liquid as if you’re eyes had super scalding power. 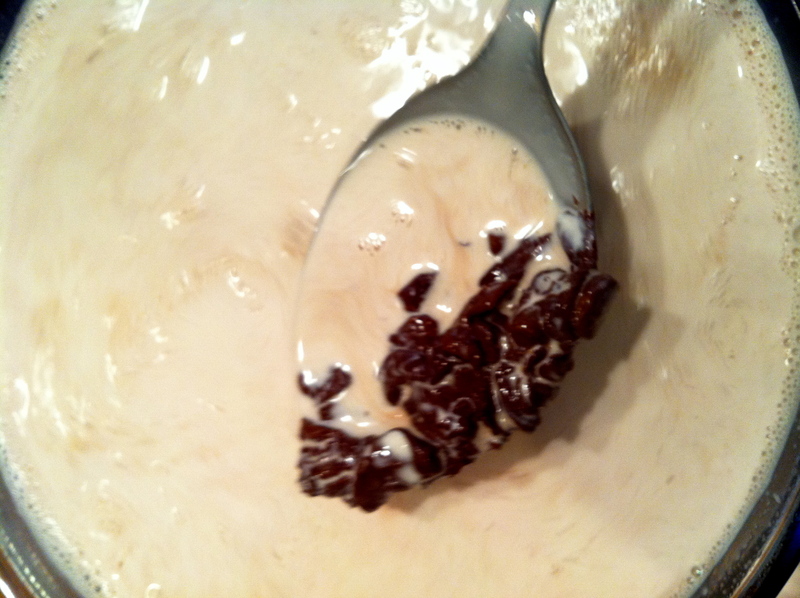 Anyhoo – once it’s at the scalding hot stage – pour it onto the chocolate chips – which you’ve combined in yet another bowl. I promise you, this is the last “another” bowl you’ll need. 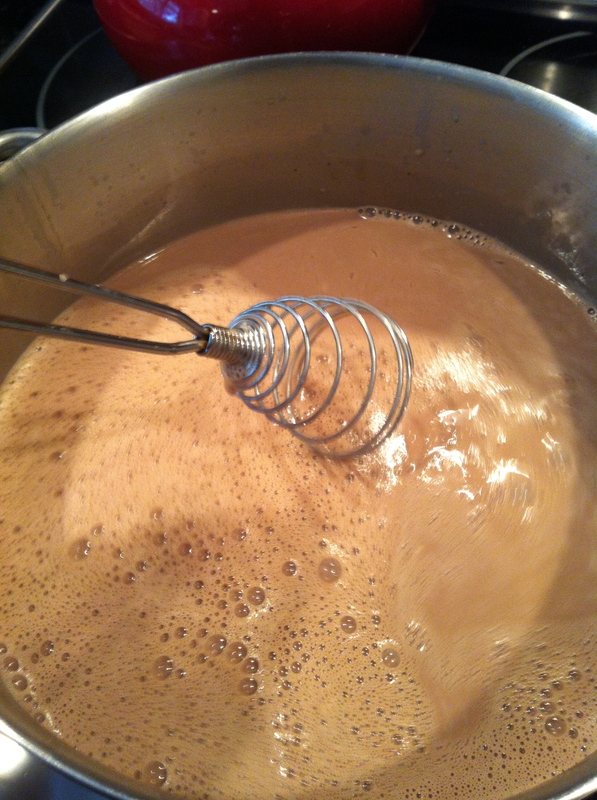 Start stirring slowing after pouring and you’ll see the chips magically dissolve leaving a big fat pot of chocolate half&half. You can just stop here and have that for desert if you’d like. No one will know. 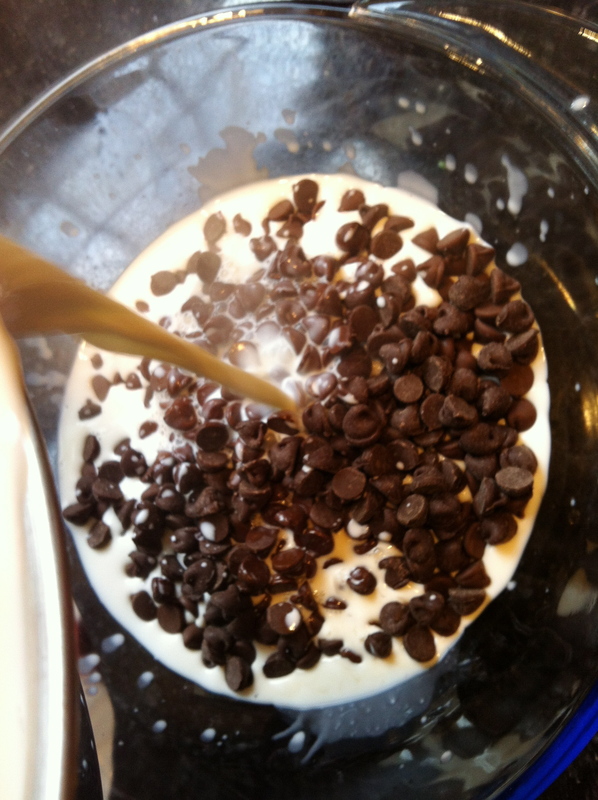 Once the chocolate has fully dissolved, slowly, carefully, pour the egg mixture in – all the while whisking as you go (and then try taking a picture at the same time. I’m just sayin’). 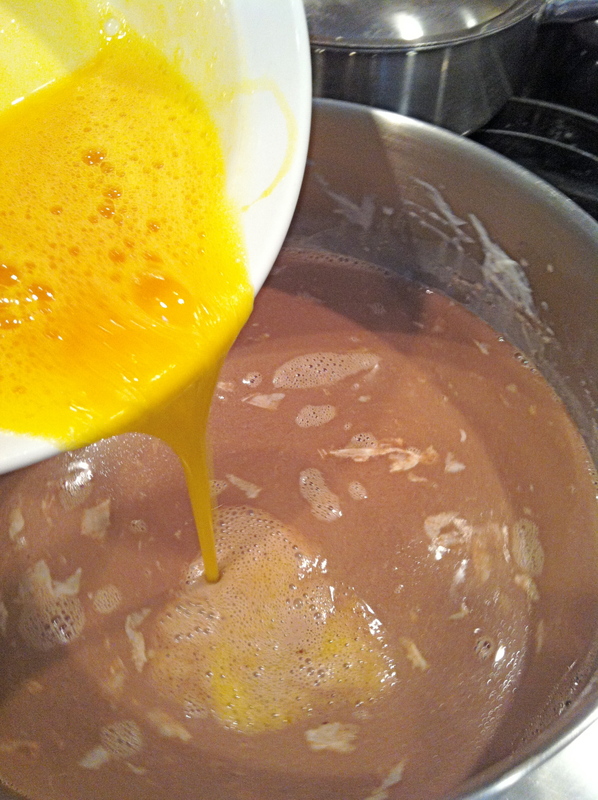 If the odds are in your favor and you don’t have chocolate egg curdles – pour the mixture onto the cubes of bread. 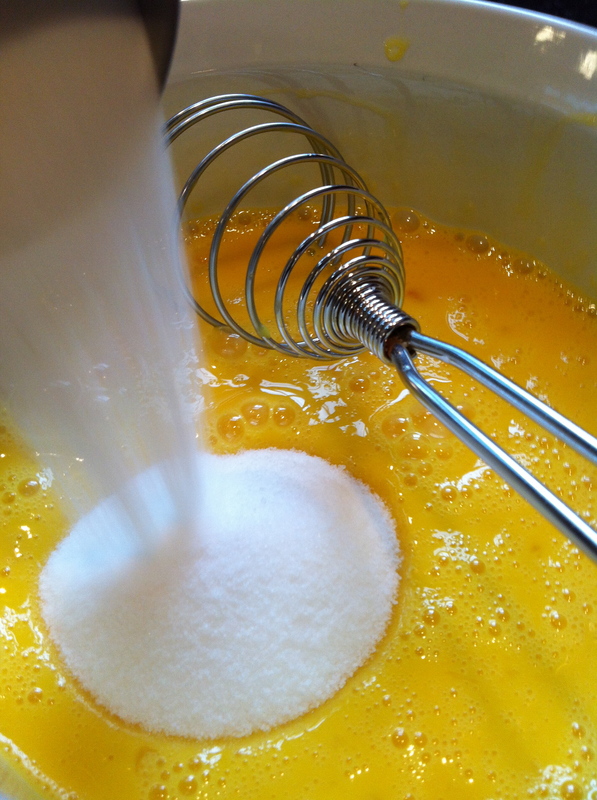 The book calls for pouring the liquid through a sieve first but I pretended not to read that part. 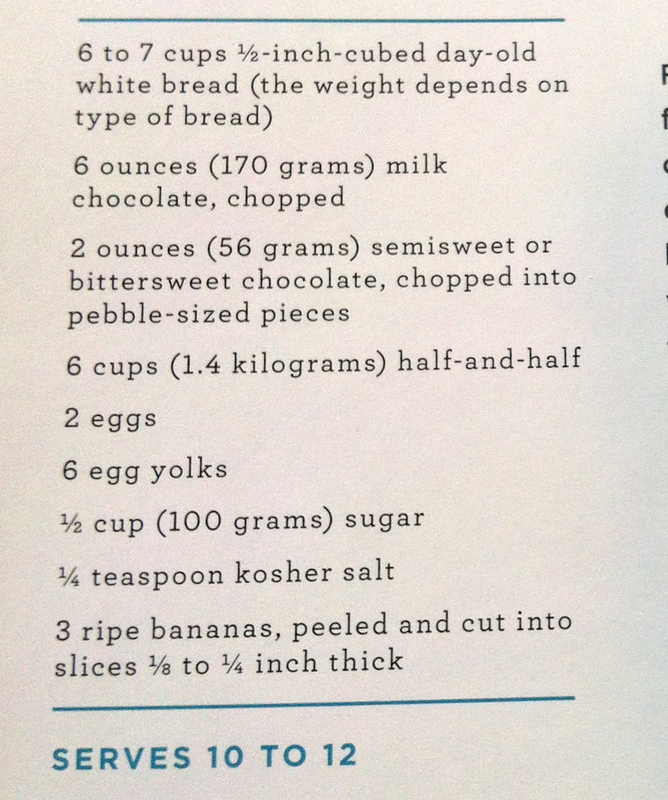 Then add the bananas. 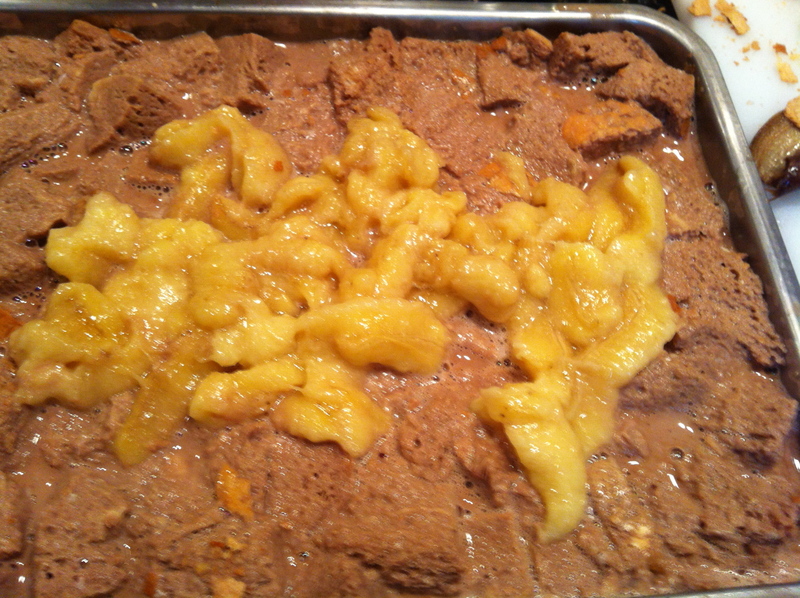 You can either slice the bananas in or in my case, squeeze the overripe goop onto the pan and mix in. Tasty. 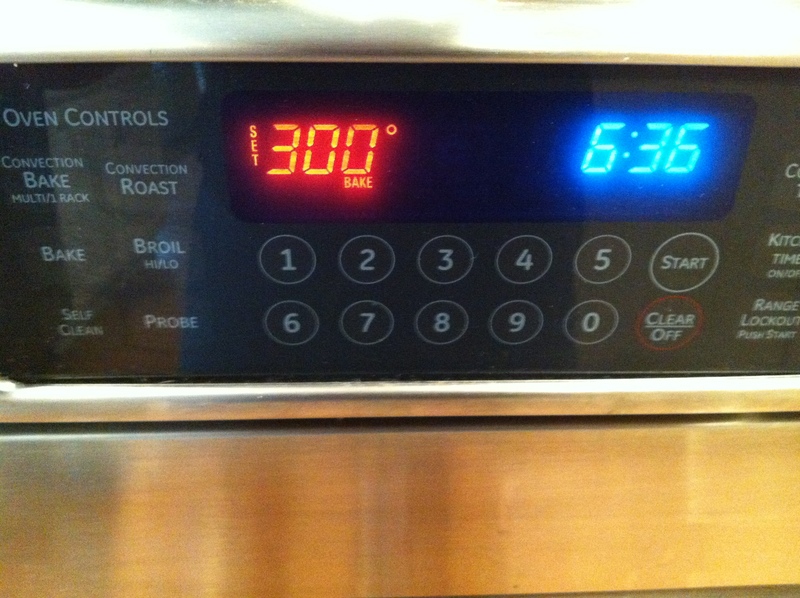 Then into a 300 degree oven for a 1.5 hours. 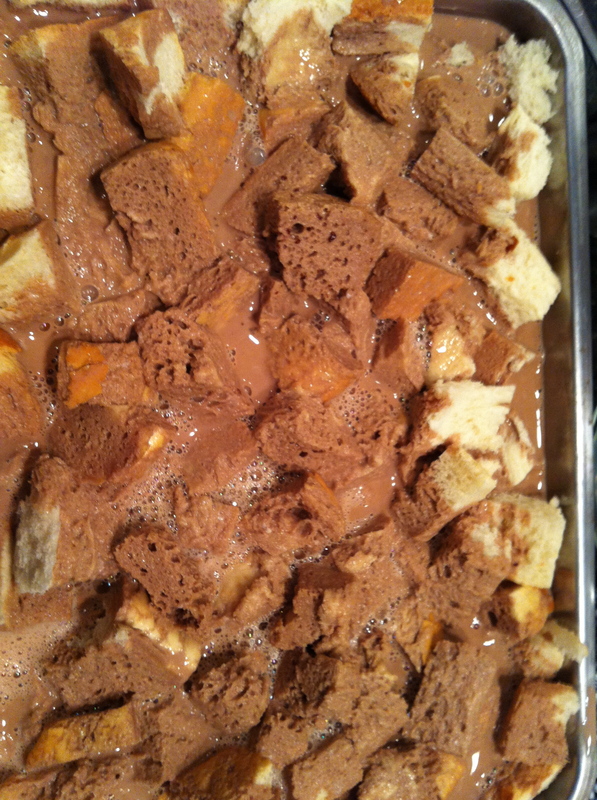 Once done – add your choice of topping – chocolate sauce, whipped cream, ice cream…. take a wild guess what I picked.